We’ve reached the point where Nora is often “too old” to be interested in the same things her little brothers are interested in. This is somewhat of a challenge for me on the days Nora is home because they want to read different books, do different crafts, play different games, watch different shows, etc. etc. However, James is now old enough to hang with Simon, so on the 3 days Nora is in school each week, I have a lot more time (and energy) to do fun things with the boys while Clara is sleeping. 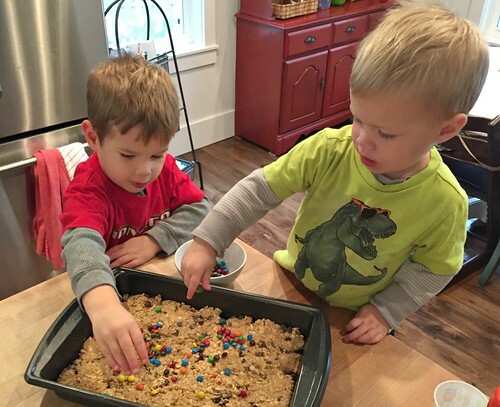 Today’s recipe is definitely an easy one — it’s from my neighbor who also has 4 little kids — and it’s a super yummy snack or dessert my kids love. 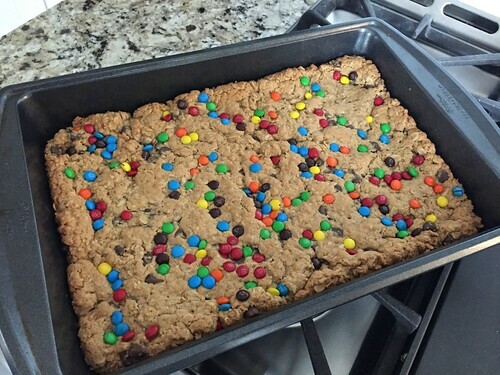 Makes a 9″ x 13″ pan of bars. Preheat oven to 350ºF. Grease a 9″ x 13″ pan, set aside. 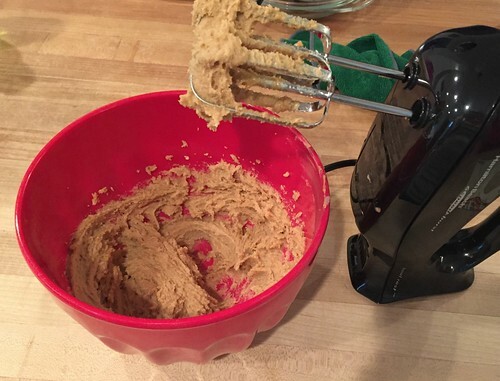 In a large bowl, cream together butter, peanut butter, brown sugar, vanilla, and egg. 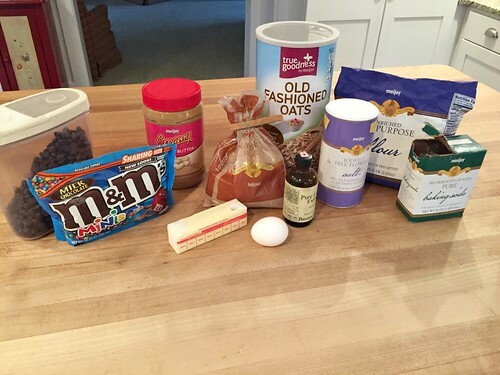 Add in all dry ingredients (except M&M’s) and mix until just combined. 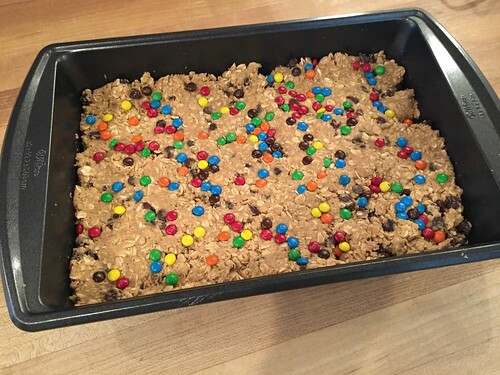 Spread batter in pan and sprinkle M&M’s on top. 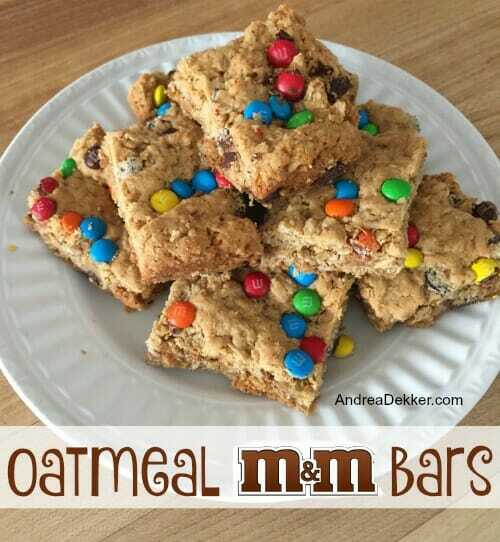 These bars freeze great (both as already-made bars and the dough) and could probably be made into cookies as well — but bars are easier in my opinion! 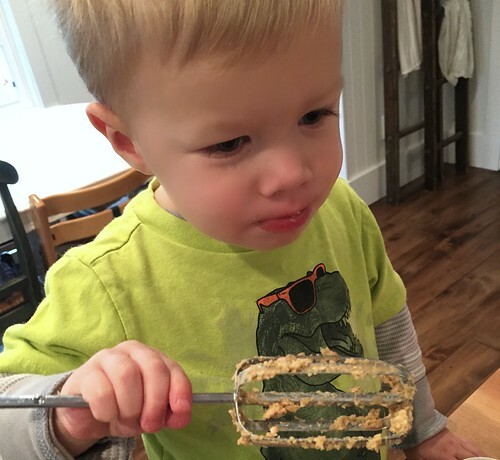 I am certainly thankful Nora’s school is NOT peanut-free, but if you need to do peanut-free recipes, I’m sure you could substitute any peanut butter alternative with fabulous results. It would also be fun to put holiday-themed candies on top depending on the time of year — because the candy is always the kids’ favorite part of this recipe! Or maybe it’s licking the beaters! 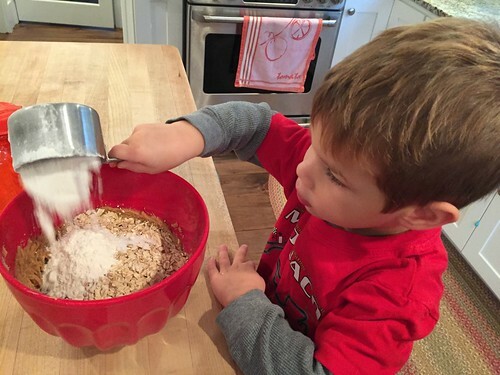 What’s your favorite recipe to make with little kids? This is such a great, versatile recipe. I didn’t have choc chips or m and ms so I put raisins in the mixture and then melted some plain chocolate to drizzle on the top when it was finished. I can think of lots of other variations as well. Absolutely delicious! Thank you. yes definitely (most of my recipes are easy to change out ingredients based on what you have in the house). Glad you made it work for you! Oh my goodness yummy! 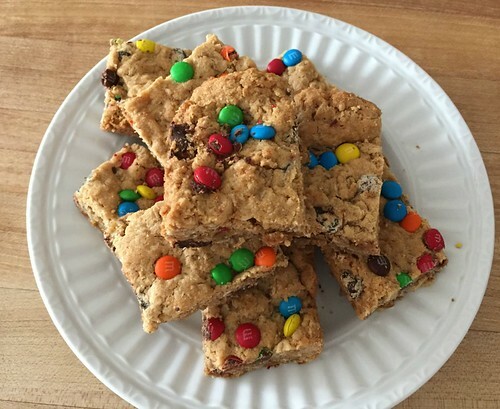 I made them with some itty bitty Reese’s peanut butter cups — on the same aisle as chocolate chips — my store did not have M&Ms except in the small checkout counter bags. Just a reminder — and keep in mind that I’m a person who makes her own mayonnaise with raw eggs — little people should not lick the beaters! Raw eggs can make a child sick and it can be serious. I get my eggs from a local rancher and I always wash them carefully before I use them. I think the bacteria in eggs is probably on the outside of the shell but it can conceivably be inside. One of the other RNs I work with nearly lost a child to salmonella poisoning from some bad potato salad bought at a deli counter. Since we are gluten free I made the cookies with almond flour and a small bit of rice flour. There’s no way to get that gluey dough with straight almond. I found some blended peanut butter at Whole Foods that contained no added high fructose corn syrup and it did not require stirring!!! I made this recipe about three hours ago using Sunbutter, (sunflower seed butter), and the bars turned out delicious. I didn’t have M&M’s so I threw more chocolate chips on top. My bars took about 18 minutes to bake as my oven is old and needs to be re-calibrated. Thanks for the recipe, Andrea. Do you mean quick or old-fashioned oats rather than steel cut? I see old-fashioned in your photo so I am going to try that version! yes, sorry! I just changed the recipe to say “quick or old fashion” — duh! 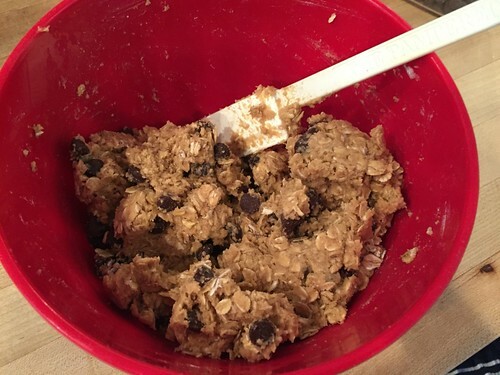 I used the oats in the big bag from Trader Joe’s — they are rolled oats and I think they are called Quick by Quaker. I bought some from Costco once and there were stems in them. The Trader Joe’s are rolled thicker than the Quaker and they hold up well in meat loaf also.